An intuitive control layout puts what you need right where you need it, and available dual-zone climate control helps ensure that everyone stays comfortable, no matter the ride. And for those times when you want to take in some fresh air, CrewMax also features a standard power vertical rear window. 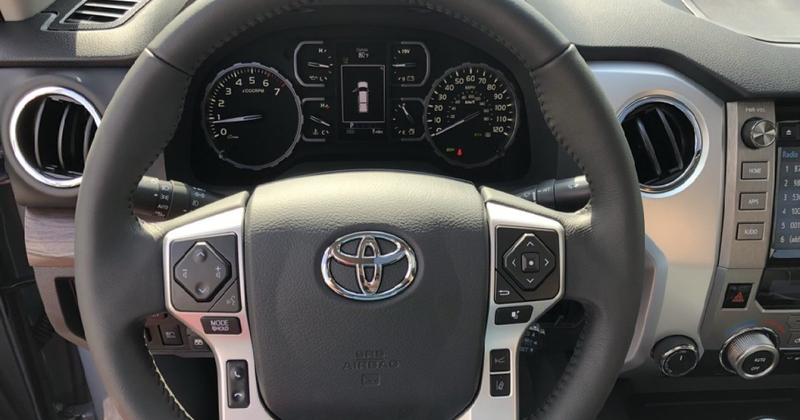 2018 Toyota Tundra Limited 4WD, Lb20/Black Leather. This Tundra has modifications made, including a lift kit. Heavy-duty safety to help carry you through the long haul. Toyota’s Star Safety System™ is a suite of six safety features offered standard on every new Toyota. The system includes Vehicle Stability Control (VSC), Traction Control (TRAC), Anti-lock Brake System (ABS) with Electronic Brake-force Distribution (EBD), Brake Assist (BA) and Smart Stop Technology® (SST). Termed “active” safety features, they’re designed to operate in certain situations to help prevent accidents from occurring in the first place. Take towing to a whole new level. Tundra owners take on and tow a lot — workloads, home improvement projects, and last-minute getaways. 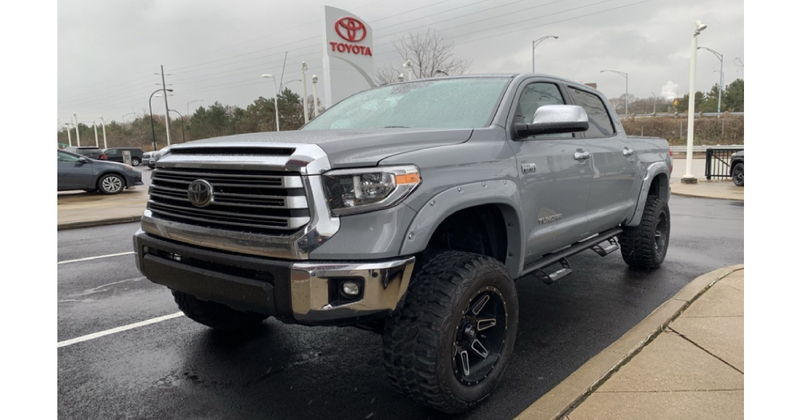 When properly equipped, Tundra has a payload capacity of up to 1730 lbs., plus an available deck rail system and an easy lower and lift tailgate, to make these adventures a little easier to tackle. Some say loading, unloading, hauling and towing a ton of lumber, gear and supplies is a ton of work. Tundra owners have another word for it: Saturday. Toyota Safety Sense™ P (TSS-P) is an active safety package that comes standard on every new Toyota Tundra. This advanced precautionary safety system combines the Pre-Collision System with Pedestrian Detection (PCS W/PD), Lane Departure Alert (LDA) with Sway Warning System (SWS), Automatic High Beams (AHB) and Dynamic Radar Cruise Control (DRCC) to assist you. TSS-P’s comprehensive features create in-the-moment safety designed to support your awareness and decision-making on the road. 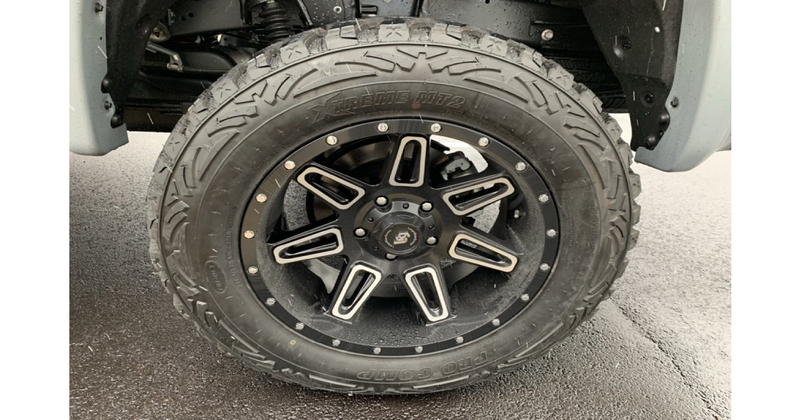 2019 Toyota Tacoma TRD Pro for sale HERE! Twitter, Facebook, Google+, Linkedin. Shop and Detailing – Sales Professional for this Lifted Tundra Contact! 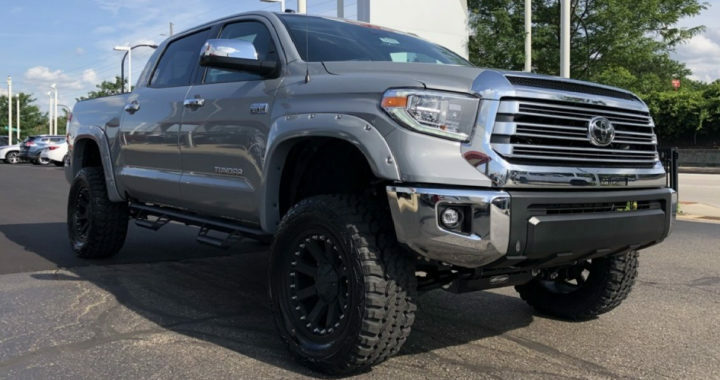 Posted in New Vehicles and tagged 2018 Toyota Tundra CUSTOM LIFTED CREWMAX, Custom Trim of America in Akron, Jacked-Up Tundra for sale in Akron Ohio, Lifted Toyota Tundra, Lifted Tundra for sale in Akron Ohio, New Tundra For Sale in Akron Ohio, Toyota Tundra Jacked up, Toyota Tundra Limited 4WD for Sale, Tundra, Used Tundra For Sale in Akron Ohio, Used Tundra For Sale in Cleveland Ohio.